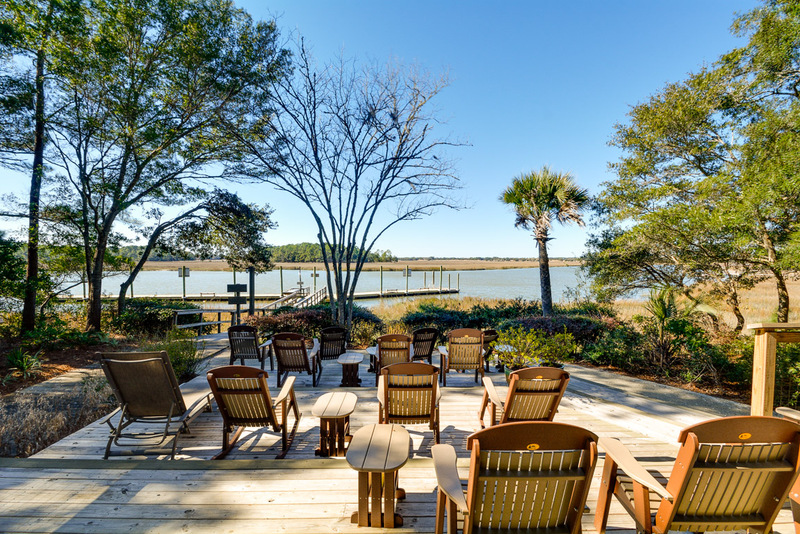 This Kiawah Island vacation rental, located at 24 Inlet Cove Cottage, has been beautifully updated, features three bedrooms and a sunroom, and has access to the community pool and dock. The cottage is about a 5 minute walk to the beach. The living area offers comfortable furnishings, TV and DVD player, hardwood floors, and French doors to the sunroom. The light filled dining area provides seating for six, and the eat-in kitchen offers dining options for four additional people. The updated kitchen showcases granite countertops against white cabinetry and appliances. Just off the living room, the sunroom provides additional sleeping and relaxing space as well as access to the back deck. The master suite affords a king bed and private bathroom with tile shower. Across the living room are two additional bedrooms that share a hall bathroom. One bedroom features a queen bed and the other offers two twin beds. Both bedrooms have flat-screen TVs, and the twin bedroom includes a DVD player. The bathroom has a bathtub/shower combination. The community pool and dock are just across the street. The cottage is equipped with washer, dryer, and high speed wireless internet. This was a great place for our family to stay. Lots of room and very quiet but no too far from Charleston for exploring. We loved our stay! First time visitors to Kiawah and it was fabulous. Neighborhood is cute and quiet, easy walk to the beach and shopping/restaurants very close by. I even saw my very first alligator in person which was terrifying and exciting-- We will definitely be back! We usually rent a villa while on Kiawah, even though it is just my husband and myself, but we decided to sample a cottage on this visit. We love the location and the serenity of this cottage. It was especially lovely to sit on the dock and wait for dolphins to cruise by. We love love loved our little getaway spot. Perfect access for the beach, it's a cozy little spot to enjoy some quiet and recharge. Coffee in the sunroom was our favorite way to start the day. It's easy access into Charleston, which we loved exploring. It's about a 40-minute drive, but totally worth it. Word to the wise -- important check-in information comes via e-mail, not just the app. Perfect for our girl's weekend! WE LOVE KIAWAH AND HAVE BEEN COMING TO VACATION HERE FOR OVER 20 YEARS. This was the perfect, quiet spot for our first trip to Kiawah. The cottage was very clean and updated. The communication from Akers Ellis was well organized. Just be sure to use the app and check for their emails! The rental had everything we needed. Pool was very nice and right across the street; beach was beautiful and about 10 minutes away by foot. We took pics at sunset from the dock (though bugs were pretty thick). We also enjoyed jogging and biking on the pathways and on the beach. Charleston was 45 min away and we went there twice during the wk! There is plenty of golf and tennis to be had, as well as shopping at Freshfields, which is quite convenient. Would recommend Red's Icehouse (Seabrook Island) for cheap eats on the water, and Fat Hen on Johns Island for a nice dinner, though you'll need a reservation. Wonderful stay! Would love it if bikes were available with property rental. Hi DJ, While we do not provide bikes, we have plenty of bike rental companies to recommend. We are thrilled you enjoyed your stay! This was a great vacation experience. The Akers Ellis team is very professional. They guided us in every step along the way and were there for us with any questions or requests. This was the best property management experience we have ever had. The cottage was well appointed would taste for fixtures. It was very clean. 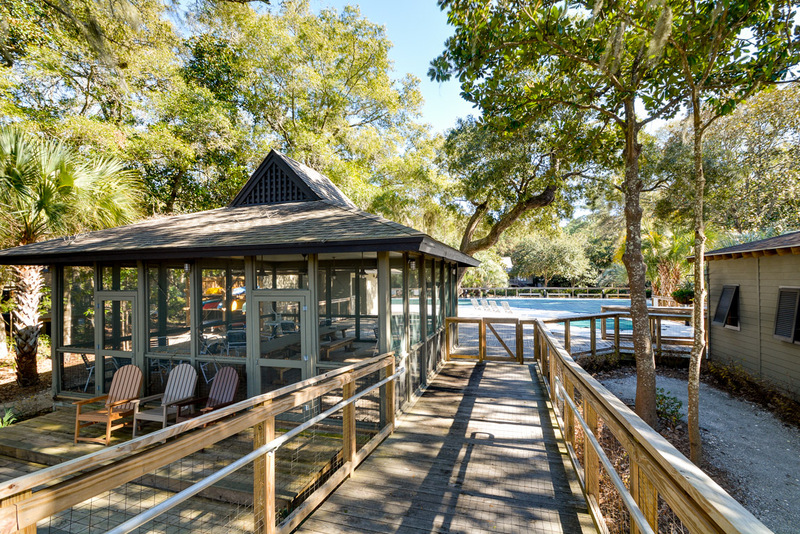 The cottage was conveniently located near to the pool a dock and to the general store. It was a very safe and welcoming community. There was lots of things to do nearby and the trip was highlighted by the total eclipse of the sun. 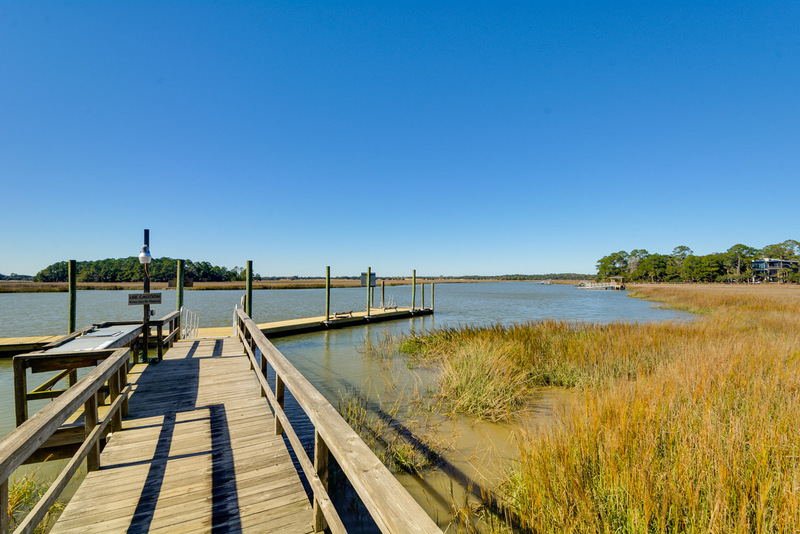 I would recommend this cottage and the AK team to anybody looking to rent in the Kiawah Island area. This was our 12th or 13th trip to Kiawah, and our second to 24 Inlet Cove. The house is well-furnished and well-situated. We had a great stay and love this particular home. The Team was Great at Making Things so Easy For Us! We had a fabulous vacation on Kiawah. The house was beautiful and your team were great at making things so easy for us. Things started off a little rocky, arriving Sat evening, 95 degrees F outside, and AC not functioning! Once I found I could not fix it, I contacted Akers Ellis through the app, and got a service response within a couple hours. Tech charged the unit, it slowly returned to cooling, and everything was fine. Kudos to the Akers Ellis staff for contacting me and offering other accommodations for the evening if the AC was not good enough. Everything else was fine - the unit was clean, well furnished and decorated, and the nicest of 15 units my family has rented over the years in Inlet Cove. Comfortable as being at home. Our stay was very pleasant in this home. The staff was very curtious, and made booking a breeze. We found the home updated, and had what we needed for a relaxing stay. Access to the owners closet was very nice, as it provided extra crab nets and fishing poles. My son had a blast each morning walking a few steps to the dock to fish. The pool is just a step outside the front door. We loved the location, and will stay again. There was a power outage for a few hours during our stay and the staff at Akers Ellis notified us right away, via email, and the app (we were not there to know) which helped us plan our day accordingly. 5 stars! Love the mobile app and that you have people in the office to answer the phone on a Saturday during check in time.